International Line work in industrial and commercial sector ranges from your basic foundations works through to your more complex multi-story developments and everything in between. Essentially, International Line offers a high standard quality of work in all areas of concreting and finishing works. The ongoing high and continually rising standards which International Line Constructions, as a company sets itself, ensures us of customer satisfaction. This is our commitment to you as a customer, that your satisfaction is our major priority. We therefore strive to achieve the highest possible standards. It is our policy to ensure that all projects are executed in accordance with contract specifications and drawings, within the contractual time frame, and in compliance with all legal requirements thus providing good value and satisfaction to our Client. The Company Management is committed to continuously improve the effectiveness of the quality management system by analyzing customer feedback, conducting internal audits, imparting training where necessary and review of the Quality Management System. The policy is applicable to all divisions, sites and subcontractors. International Line’s management and employees are committed to provide value-added quality services and products that fully confirm to regulatory as well as client’s contractual requirements. Continuously develop and enhance organizational capabilities to retain competitive advantage and efficient operations. 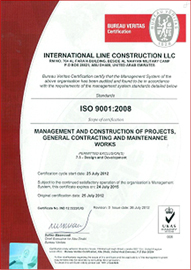 It is the company’s policy to establish, maintain and continually improve an effective and efficient Quality Management System that complies with ISO 9001:2008 standards requirements.